During our first four years we were still officially linked with the congregation in Lucan (Cecil – the minister in Lucan is TREVOR MORROW) but on November 25th 2007 we were formally constituted as a new independent congregation by the Dublin and Munster Presbytery of the Presbyterian Church in Ireland. On that occasion, Rev Dr Keith McCrory (to give him his full and seldom used title!) was installed as our inaugural Minister and we were up and running…. As a Presbyterian or Reformed church, we are part of a fellowship of churches in Ireland and throughout the world who are committed to the ongoing reformation (Cecil – this is most peculiar terminology as Presbyterianism recognises the Bible to be its supreme authority and the Westminster Confession of Faith to be its subordinate standard and so in reality there would be precious little if any scope for further “ongoing reformation”) and renewal of the one church of Jesus Christ, in accordance with the scriptures and under the guidance of the Holy Spirit. Therefore, as part of our ministry, we want to encourage and affirm every congregation and community, regardless of denomination, where the presence and authority of the Lord Jesus Christ is found (Cecil – such genuine ‘Biblical Ecumenism’ grounded on the truth of the presence of the TRUE Person and Work of the Lord Jesus Christ is welcome but is that what Maynooth actually practice? – this short article will attempt to answer that question). From that article it will be clear that Trevor Morrow is fully immersed in the modern unscriptural ecumenical movement that seeks to portray the Roman Catholic Church as a ‘sister Christian church’ and Roman Catholics as genuine brothers and sisters in Christ. In the light of this Lucan/Morrow influence it should come as no surprise then to find that Maynooth Community Church is likewise embroiled in unscriptural practices that promote Roman Catholicism as an authentic form of Christianity. On Saturday October 1st, (in Maynooth Post-Primary School, from 10.30am to 1.30pm) MCC will be led by Rev. Tom Wilson of Kilmakee Presbyterian Church in Lisburn to begin learning the deep and rich Spiritual Exercises of St. Ignatius Loyola, the founder of the Jesuits and key influence on the Catholic Reformation. All are welcome. It will be a great event. Ignatius Loyola founded the Jesuits and this is what he is primarily known for- being the father of the Catholic Reformation. In the heat of the Reformation polemics, those of us in the Reformed stream of Christianity missed out on the splendid and rich tradition of prayer that Ignatius developed. Helped by Rev. Tom Wilson of Kilmakee Presbyterian Church, on Saturday October 1st MCC is going to be introduced to the spiritual exercises of Ignatius. 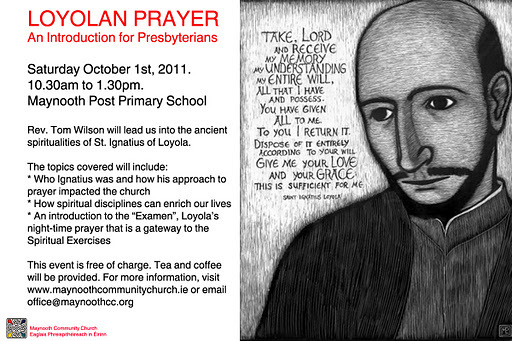 We’d love for you to come along to this “Loyolan Prayer: An Introduction For Presbyterians”! In some senses, this is a follow on event from last year’s Calvin and Loyola Conference that we helped to host in Maynooth College. Tom will introduce us to Ignatius’ life and the impact of his ministry on the church as well as tell us his own story of how he was drawn to the Spiritual Exercises and the difference they have made for his life. In the second talk he will give us a hands-on guide to theExamen, the night-time prayer of Loyola that serves as a kind of gateway into Ignatian spirituality. All are welcome. There is no cost. Tea and coffee will be provided. Contact the MCC Office at office@maynoothcc.org or give us a ring at 01-5054990 for more information. You will note that I have highlighted in red the reference to a ‘Calvin and Loyola Conference’ held last year and they credit that conference for being the forerunner of the meetings they are now hosting. St. Ignatius of Loyola (1491-1556) was the founder of the Jesuits, and was canonized by Pope Gregory XV in 1622. He published the Spiritual Exercises in 1548. The Exercises were intended for use during a retreat; and are a central part of the first year training of Jesuit novitiates. However, one does not have to be a Jesuit-in-training to take advantage of the Exercises: Increasingly, lay people and even non-Catholics follow this path. At this point I am ‘exercised’ to say that on this evidence Loyola was a through and through Roman Catholic who was clearly fully committed to his [RC] ‘Church’ and its ‘Christ. The aim of these ‘Exercises’ seeks to ensure that he and others who follow the ‘Exercises’ are likewise completely ‘in union’ with these at the expense of ‘union’ with the true Christ and His true Church. Those then were my comments on Loyola’s ‘Spiritual Exercises’ and from them it is evident that in no way do they constitute a ‘rich tradition of prayer’ that would be in accord with the truth and teachings of God’s Word, the Bible. (Cecil – pray tell me just exactly what ‘Catholic reformation’ that would be – the main ‘Catholic’ event of the 1500s was of course the Council of Trent and that certainly did not herald any ‘reformation’ of Roman Catholicism but rather was an ’enshrinement in writing’ of all the then Roman Catholic heresies [additional heresies have been added since then] and it also included of course many ‘anathemas’ against all those who reject Roman Catholicism and its heresies and these anathemas are still in force to this day having been ratified afresh by the Vatican II council). It was a pretty awe-inspiring session for those of us who were there. In the first part of the morning Tom told us his own story and how he ended up being a Northern Irish Presbyterian Minister who found deep spiritual nourishment and guidance from the Jesuits. He also revealed how deeply Scriptural the approach developed by Loyola actually is. In the second half of the morning he led us into the Examen, the night time prayer of Ignatius. He laid out a number of different ways this prayer of recollection could be approached. We all got it. For many, this structured approach to daily prayer was deeply rewarding and deeply attractive. You might well hear much more about the Ignatian Spiritual Exercises in the coming months at MCC was take up the Examen as a discipline. If you missed the day and wanted to learn more about the Examen, there are two web sites that I think are really helpful. The first is run by the Jesuits in Ireland and it is called Sacred Space. It is a daily reflection and prayer web site that allows you to draw on the Ignatian spiritual disciplines, including study of scripture, (Cecil – provided of course that ‘study of scripture’ lines up with Roman Catholic heresy as taught by the Magisterium) to connect with God. The second is a more general Ignatian resource called The Daily Examen. This is run by the Jesuits in America and it is full of great resources and videos to get you started. As a Christian, when I read something like that blog entry, I really have to pinch myself to assure myself that I’m not dreaming or perhaps more appropriately to confirm that I’m not having a nightmare. How anyone can write this and claim to be from a ‘Reformed’ church is totally beyond my comprehension. It is abundantly clear from what is happening in Maynooth that leaders like Keith McCrory (minister of Maynooth Community Church) and Tom Wilson (minister of Kilmakee Presbyterian Church in Lisburn) who is the speaker at these meetings in Maynooth, are assisting the devilish work of the Jesuits who ever seek to overturn and obscure, with the dark and soul-damning blanket of Roman Catholicism, the liberating truths that were graciously revealed again by Almighty God at the time of the Reformation.